The iPhone SE 2 has recently been tipped for a launch in September this year, as dozens of leaks and rumours continue to circulate the Internet. Interestingly, one of the most notable aspects of the leaks is that Apple might ditch a compact design in favour of a larger display, possibly even 6 inches in diagonal length. In my opinion, that would be a big mistake (no puns intended) as the form factor is the main USP of the iPhone SE range. Back in March 2016, its predecessor iPhone SE was first unveiled to the world by the Cupertino giant. A 4-inch display with premium internals was an uncommon trend even a couple of years back, but the iPhone SE was solid. It performed well, sold well, and was the perfect handset for users who liked to keep things simple. Fast forward to 2018: the iPhone SE is still extremely relevant as a secondary device, if not the primary choice. On a work trip to London, I decided to carry my primary driver – the iPhone 7 Plus – and the iPhone SE with me, as a secondary smartphone, to make sure I don’t have to lug around two huge smartphones and also to get a sense of how the compact handset performs more than two years after its launch. Of course I realise the fact I have access to not one, but two “premium” devices puts me in the minority compared to most of the smartphone users in India, but it was an interesting experiment nonetheless. I mostly used the iPhone SE as a mobile Wi-Fi hotspot, for browsing through social media, and for taking the occasional outdoor shot. Let’s talk about all the aspects in a bit of detail. I got a local SIM card in London and put it right into the iPhone SE. Considering I carried an iPhone 7 Plus, a MacBook Air, and a pair of AirPods along, the iPhone SE connected seamlessly to all of them. All I had to do was login with my Apple ID which made syncing mobile data from the iPhone SE a breeze across devices. However, one thing about the iPhone SE’s hotspot capabilities that was particularly frustrating was how frequently the mobile hotspot went into sleep mode, causing me to repeatedly toggle the settings. Of course it’s worth posting out this happened when I was using the phone’s Low Power Mode, which is what a lot of iPhone users tend to use while on the go, especially when using the iPhone in question has a small battery. Being a self-proclaimed social media aficionado, one area where I thought the iPhone SE might disappoint was the way I multitask between social media apps – sifting through Facebook, Instagram, Snapchat, and Twitter in an attempt to satisfy the FOMO (Fear Of Missing Out) that plagues us millennials perennially. Having installed all those apps on the iPhone SE, performance was not an issue. What seemed like a problem, however, was the sheer difference between the two display sizes on the iPhone 7 Plus and iPhone SE. Fortunately enough, with prolonged usage, considering I don’t have the biggest of hands, browsing on the iPhone SE seemed much more comfortable and the lack of screen real estate led me to cut down on my excessive social media usage. 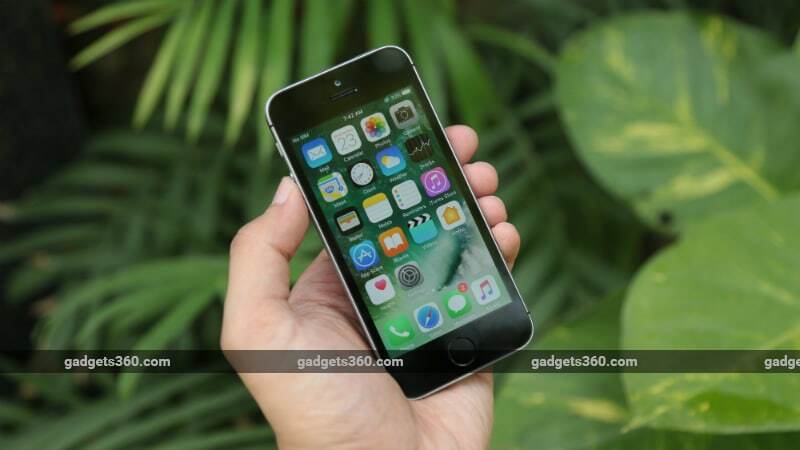 Running the two-year old Apple A9 SoC, the iPhone SE had no problems handling the multitask load and was snappy while loading real-time content on all the above-mentioned apps. Touch ID was quite fast, but it’s safe to say I’m happy we’ve left the days of the “clicky” home button behind. Apple’s smartphone cameras have always ranked among the best, offering a great level of natural colour reproduction as well as ultra-stable video recording. While I did have the much powerful dual camera lens setup of the iPhone 7 Plus, I wanted to test out how relevant the iPhone SE’s cameras were in 2018. My test location was the beautiful Windsor Castle, recently in the news thanks to the royal wedding. Daylight clicks were brilliant, with the rear camera displaying its prowess months after it was first showcased. Colour reproduction was accurate, as were the brightness levels. Close-up shots had a good depth to them, with vibrant colours once again. Indoor shots with decent lighting turned out to be good enough with the slight hint of pixelation. In low light conditions, the iPhone SE underperformed and couldn’t seem to focus on the subject fast enough, which is no surprise given Apple’s newer offerings have been a bit behind the competition in this department. As for selfies, clarity was accurate and the lack of a beautification feature was refreshing, considering the market is flooded with selfie-enhancing software tricks in 2018. While it couldn’t beat the iPhone 7 Plus, it came close which is in itself a huge feat for a 2016 smartphone, especially one that is sized smaller than most phones today. I used the iPhone SE as a secondary smartphone but I don’t see any reason why it cannot be considered as one of the top picks in the sub Rs. 20,000 price segment. The phone currently retails for an MRP of Rs. 26,000 for the 32GB variant and Rs. 35,000 for the 128GB model in India, but it’s usually available well below the Rs. 20,000 mark online.